Tanara McLean lives in Edmonton. She's black... and has no black women friends. So what do you do when you're a Tanara surrounded by Megans? You bring in the city’s Youth Poet Laureate, Nasra Adem, a fierce advocate for black women, for a heart-to-heart. "If there is any question as to who I am, let the answer fall from the sky — or be the sky itself." This is Tanara McLean's favourite part of Nasra Adem's poem "Sky." These days, the poem's questions of identity are cutting to the quick for Tanara, a CBC reporter based in Edmonton. The dilemma: Tanara is black, and she doesn't have a single close black female friend. "I don't think I'm the only person to have question about a particular group that I belong to," says Tanara. "It's easy to get stuck inside your own mind, and feel like you may be a little out of touch with people you feel like you should identify with." 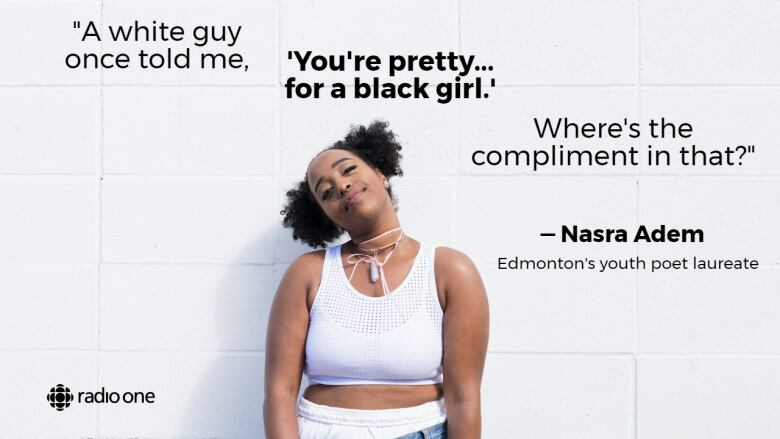 This has been bothering her recently, and she thought Nasra — Edmonton's youth poet laureate and a rising star in the spoken-word scene — would have something to say about it. To Tanara, Nasra Adem seems so incredibly comfortable with her place in the world. But that wasn't always the case. Nasra's family, who are Ethiopian-Somali, came to Canada from Ethiopia in the 1990s. They originally arrived in Calgary when Nasra was very little, and by Nasra's account, embraced the whole Canadian thing from the get-go. "My mom got hooked on Shania Twain very quickly," recalls Nasra. "Dressed me in a whole cowgirl outfit — red hat, to the tassels, to the boots, the whole thing." They relocated to a large Somali community based in Ottawa, where Nasra was part of the majority. But when Nasra was 11, the family moved back to Alberta - this time, to Edmonton, where she was surrounded by white people. She wondered, "Where do I fit in?" In Ottawa, surrounded by people who looked like her, Nasra had been the class clown, but in Edmonton, she recalls, "My throat closed up." Tanara knows this feeling very well. Her family moved to central Alberta in the late 1980s, where there was only a smattering of black people. Her moment of first feeling otherness was in first grade, playing with a couple of white friends. One had a jawbreaker and let the other white girl lick it. But when Tanara wanted to try it, one of the girls said, "Sorry, you're not like us. I can't share with you." Tanara tried to show the girl the palms of her hands, to show that they were the same colour on parts of their bodies. She suggested they all spit into a cup to show that all their spit would look the same. "We're all human," she said to them. When Tanara thinks of the injustice she feels in exploring her identity, a specific name comes to mind: Megan. "I always tell people close to me, I've been dealing with Megans my whole life. And I'm not saying that disparagingly," Tanara explains. "I went to school with four Megans from kindergarten to grade 10. And those Megans were those typical, beautiful, blonde-haired, blue-eyed women." 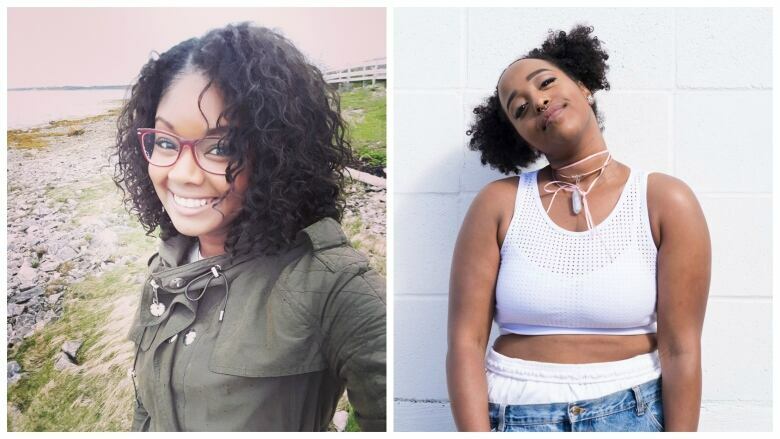 Tanara describes how growing up there weren't other girls who looked like her, but these "Megans" represented a white ideal that created a difficult point of comparison. She asks, "Can black women ever be free of that comparison?" "There is no comparison," is Nasra's response. It was these questions of identity that came up front and centre when Nasra came into a studio at CBC Edmonton to chat with Tanara. Starting with... what exactly is "black," anyway? To Nasra, the central problem with trying to define "black" is that it's a single identity thrust upon a huge swathe of difference. "It's already this thing that isn't ours," says Nasra. Nasra's solution? Messing with the formula. "I'm going to show you all the intersections, all the things that conflict with your idea of what this is, and I'm going to call it black, so that you get confused, and you hopefully you just release this idea that we're a monolith, eventually. So that's how I try and approach it: I'm just going to show you how absolutely wrong that is and how limiting it is until you get so confused that you have to let go of it." To Nasra, the other key is to create a community. "I have made it a practice to surround myself with black women," she says. For Tanara, making a documentary about her questions of identity, and including Nasra in her own journey, couldn't have happened at a better time. "Speaking to Nasra was great because it helped me reaffirm what I always knew; we all just want to be the best versions of ourselves," she says. "Race, religion, sexual orientation, fashion, none of it matters because we are just who we are. Nothing more or less, and that's all I want to be. My race doesn't dictate who I am. I do, with the choices I make." Tanara McLean has been a journalist in Alberta since 2007, working as a TV reporter, print journalist, and TV morning show host. She enjoys telling stories through her journalism, and believes fully that people's personal stories are the heart of great journalism. 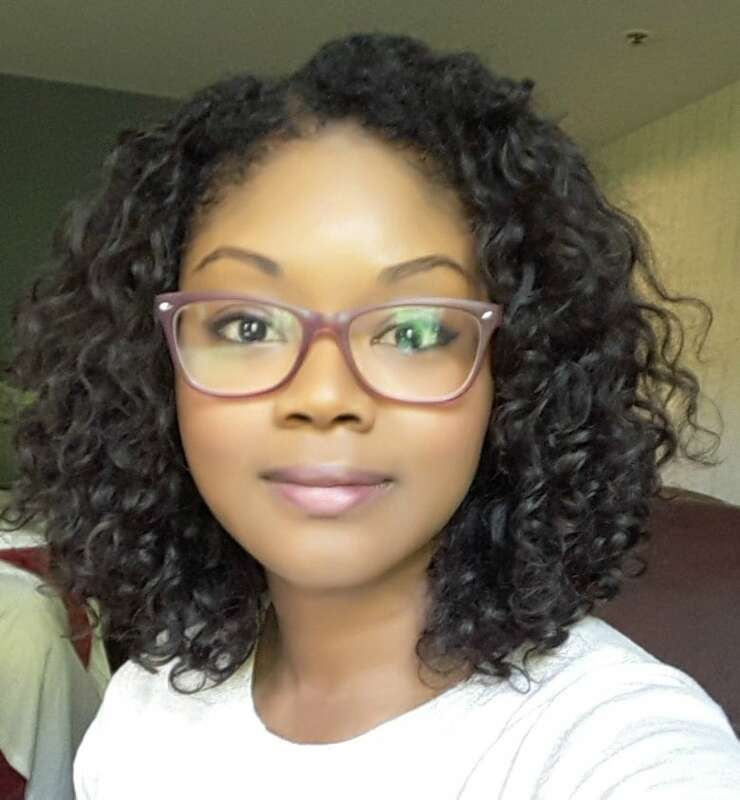 Tanara is currently an associate radio producer at CBC Edmonton. For Julia Pagel, making radio creates a chance to explore the world, and weasel her way into new places. 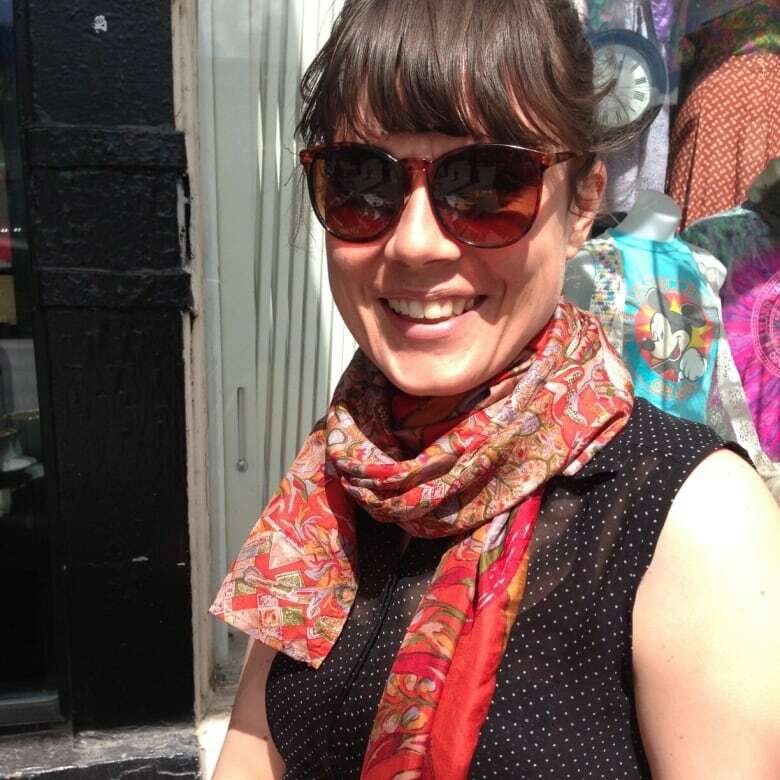 From Whitehorse to Halifax, Julia has seen a lot of this country while making radio. Most recently she's landed in Toronto, where she is the Associate Producer for The Doc Project.